I’ve been brainstorming granola recipes all weekend, to the point where I’ve just taken delivery of a bulk order of cereal mallows ? Granola may just be my new favourite thing to bake! It’s so easy, and is always appreciated greatly by my wife. And top of my list, as requested by the woman herself, was double chocolate granola. My inspiration came from the delicious Dorset Cereals Chocolate & Macadamia Granola, which is an occasional treat around here. But I wanted to create my own version, with a few simple changes, including a whole load of hazelnuts. Because what else? 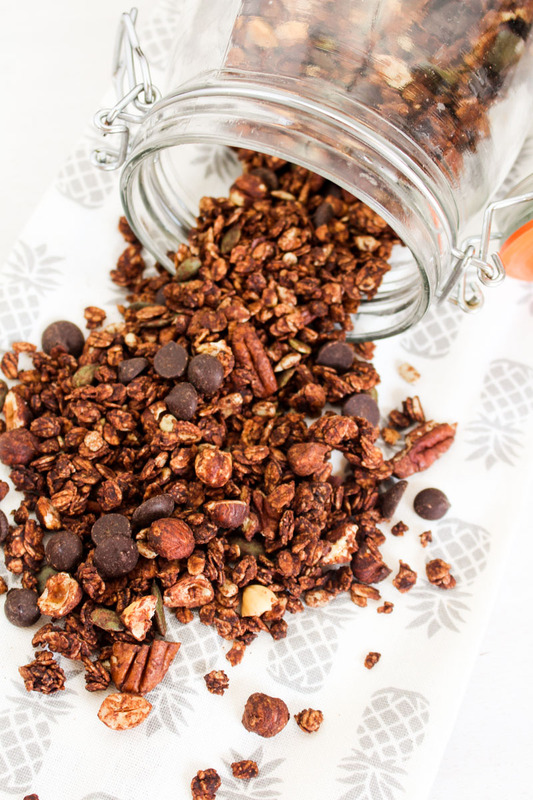 The chocolate coated oats are the foundation of this granola, and are just adapted from my cherry bakewell granola recipe which I shared with you last month. I’ve got rid of the almond essence, and subbed in a generous helping of cocoa powder. Plus, to add that little bit of extra sweetness, I upped the honey maple syrup content a little. Because plain cocoa can be pretty bitter. 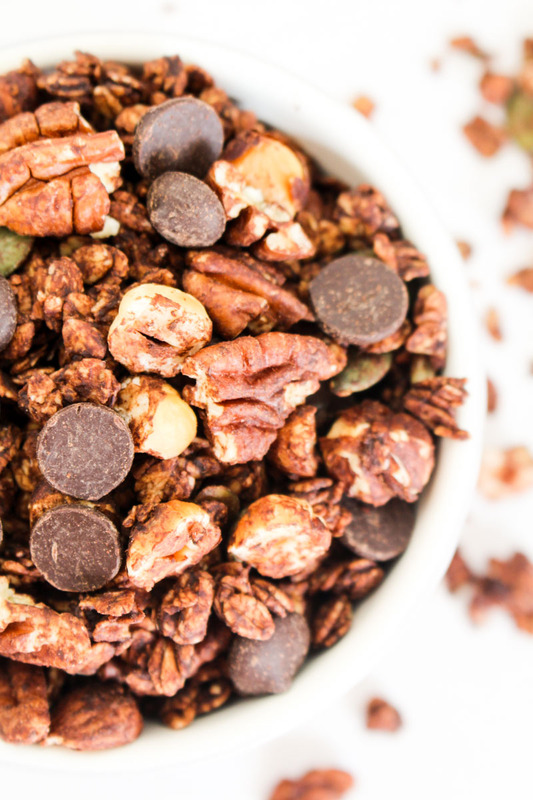 But don’t worry, this double chocolate granola is still intense – there’s no mistaking the cocoa flavour, that’s for sure. To make it ‘double’ chocolate, I threw in a very generous helping of dark chocolate chips too. I even splashed out on the Sainsbury’s Taste the Difference ones, because Katie can be a bit of a chocolate snob (sorry). You can definitely go for milk chocolate chips here, if that’s more your thing – this is definitely not a cereal that is super kid-friendly though, that’s for sure. If you aren’t a fan of dark chocolate, then the cocoa flavour means this probably isn’t the one for you anyway. Stay tuned though, because the aforementioned cereal mallows are going to be making their debut in a recipe just for you very soon! Nut wise, I skipped the macadamias in favour of hazelnut and pecan halves, as well as a sprinkling of sesame and pumpkin seeds which I had lying around from my New Year’s trail-mix phase. These all get added in with the wet oats, and popped in the oven for half an hour to toast up nicely. Whatever you do, make sure you read the recipe carefully, and don’t add the chocolate chips in until after you’ve baked the granola. Take it from me, realising your mistake after you’ve mixed the chips in is going to result in a lot of wasted time picking chocolate chips out of sticky wet oats. It isn’t fun. Isn’t that pineapple tea towel in the photo above just the cutest? It’s from Primark! They have an amazing home-ware section at the moment, so much so that my tea towel collection is getting out of hand. I’m not a granola and milk fan, so I tried this out with some black cherry yogurt, but Katie did point out that it would go amazingly well with banana or toffee yogurt too. Or just regular old milk – it will definitely turn your milk chocolatey, just like when you were a kid. 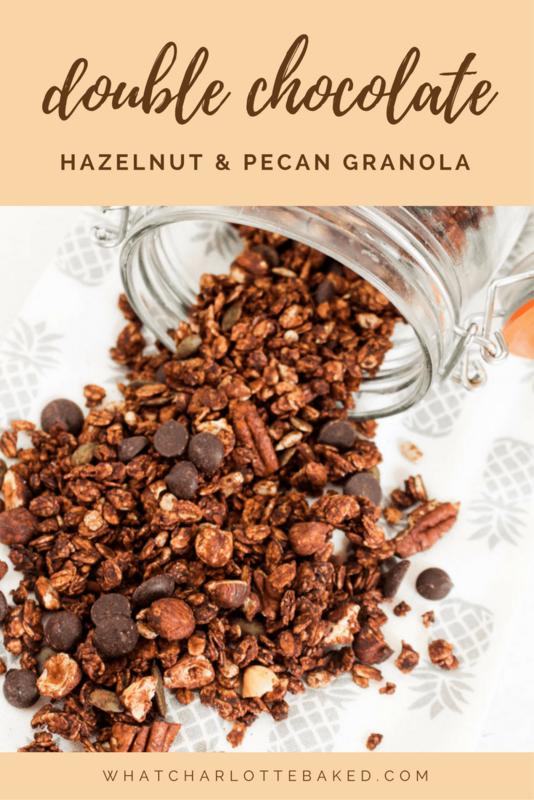 An easy homemade breakfast treat, with intense cocoa flavour oats, packed with chocolate chips, hazelnuts, pecans, and toasted pumpkin and sunflower seeds. Pour the oats into a large bowl, and add the salt, melted coconut oil, maple syrup, vanilla extract, cocoa powder, as well as the pecans, hazelnuts, and seeds. Give the mixture a good stir until all the oats are coated. Spoon the mixture onto two wide baking trays and spread out so there is a thin layer of the granola on each tray. The deeper the granola is, the longer it will take to bake. Place the trays into the preheated oven, and bake for 25-30 minutes, stirring every 10 minutes to ensure that all the oats and nuts are evenly baked. The granola is ready once the oats are almost dry, and the nuts are a nice toasted brown colour. 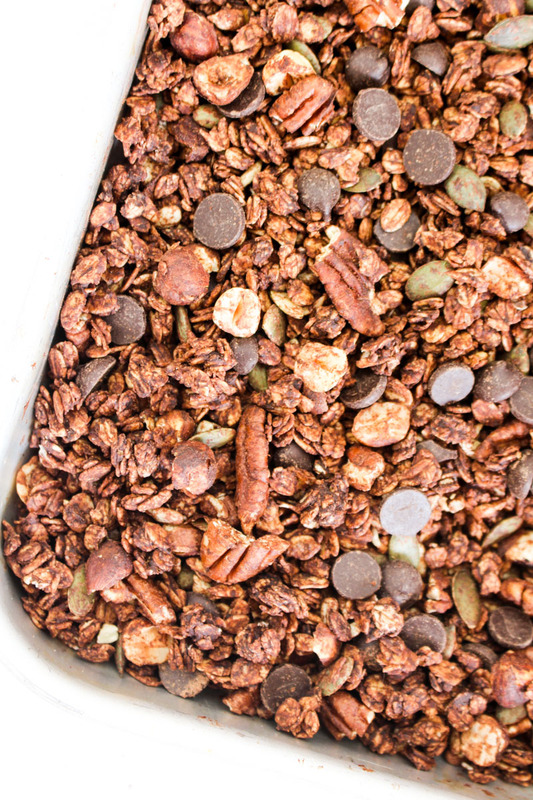 Leave the granola to cool in the trays, and once completely cold, stir in the chocolate chips. Store the granola in a airtight jar or container, and serve with either yogurt or milk. Thanks for your kind words! I’m not sure it’s healthier – but at least you know what’s going in there 🙂 You could reduce the maple syrup down a little to make it a bit less sugar-filled, and use dark chocolate chips too.